I just thought I would share this experience. One year ago on January 15, some police came knocking on my door. I had just moved to this new place and by the look on the policemen's face I knew something had happened. It turned out that the news was from my father. He had died and they had found a recent letter from me to him and that is how they had found me. That night I was wondering if he had had the time to actually read the letter and I wondered what exactly I had written in it. I knew that I had finally answered a question he had asked me a while ago. In passing I had made a comment about the "inner child," and he had asked me what that meant. On January 4 of this this year, just before falling asleep, and as clear as day, I saw my father in a vision. He was so clear and I saw how much we did look alike especially the eyes, they were so noticeable. There were no words exchanged between us but I felt such warmth and love. The next day, January 5, I remembered this was my father's official date of death reported on the death certificate. (They had found him only ten days later.) I thought, "that is probably why I saw him yesterday." In the days leading up to this morning I still kept wondering about the experience of seeing my father and the circumstances of his death and the aniversary of his death, etc... Then this morning I decided to look again at the letter I had sent him. I was struck by the fact that the letter was dated January 4th! It was like going back in time and realizing that my father must have been standing behind me while I was typing his letter. Did you notice that Jan 4 is the birthday of Marie-Louise von Franz? I am convinced that it was your father in the Beyond, who visited you. Thus, I think your vision does not deal with a "complex," but with the your real father. Perhaps you know that Marie-Louise von Franz deals in On Dreams and Death with this differentiation between a complex and the real deceased. I would take this synchronicity as a hint that you have the task to develop further your relationship with the deceased, especially with your father. It is funny that I am writing about all this exactly now. I show that during the first years of the 20th century up until his breakdown in 1913 this archetype was deeply constellated in Carl Jung. It is the archetype of Hermetic alchemy, and the most important demand of it for the consciousness is the "become like children" (not remain a child!). Since during this time Carl Jung defined himself yet as a scientist (he never really overcame this state), he was not able to live the Hermetic archetype (the unio corporalis, as I describe it in Chapter 4 of my Holy Wedding). As much as I can see the most important aspect of the "child" -- and also of the archetype of the fool -- is giving up thinking and "let it flow." As much as I know you can do this very well. For us men and also for intellectually (over) trained woman it seems to be much more difficult. And thank you that you post this in the UNUS MUNDUS forum. I think more and more that it is important that as many people as possible should deal with the relationship with the deceased. As I showed in http://www.psychovision.ch/hknw/holy_we ... h5p3_e.htm in his relationship with his cousin Helly Carl Jung did this already during his high school time, then however, under the influence of his association experiment and of Freud he redefined the ghosts as complexes. Later he was thrown into what he called the collective unconscious, and as I wrote above never found really back to the Beyond, the unus mundus, to the realm which is more general than the c.u. It seems that now the time is ripe that we accept this more general realm and that we have to relate to it in a different way than with the method of Active Imagination. A.I. gives us access to the c.u., to what I call the collective spirit-psyche. It seems however that Body-Centered Imagination (which can be done in many different ways) relates us with the Beyond or unus mundus, the matter-psyche/spirit-psyche realm. svadhisthana, the second chacra, the relationship with the Beyond takes place. With your contribution you give us a nice example of how this works (in your case). Last edited by Remo Roth on Wed Jan 10, 2007 12:58 pm, edited 1 time in total. I rent a new flat. Exactly in this moment I'm dealing with the Deutsches Requiem (German Requiem) of Johannes Brahms. The words "Wie lieblich sind deine Wohnungen, Herr Zebaoth" (How lovely are your flats, oh God) do not go out of my mind. I'm forced to think at them, and these thoughts are accompanied by an intense positive feeling tone. Later I realized with the help of own and dreams of my patients that "flat," "house" means mostly one's own body. In opening the door with a passe partout (a key that opens all locks) I hear someone calling my name. I turn around and realize that it is my god-father deceased 1 1/2 years ago. His name was Felix; "Felix is latin for 'Happiness'" (Kristin). ; see the bliss below ! I look into his face and realize that it is completely beatific and shows the expression of total bliss. Then I take a look at his body. It is very different from the body of a living human, slightly blurred, oscillating and transparent. During noting this dream into my diary I have the spontaneous association that like this the subtle body could be presented to the living humans. Later I realize that the similarity with the description of UFOs is striking. During and after the dream I have the feeling that this dream is a really numinous experience. I cannot almost describe it with the help of words. I guess that mystics have such intense feelings and corporeal sensations in the ecstasy. Further something in me knows instinctively that this bliss belongs to the resurrection after death. My God-father does not exactly know what he could tell me. I, too, am somehow inhibited, since I read somewhere that one should not approach the deceased to close. As I wake up I feel an intense warmth in my back, at the place of the heart. I guess that the anahata chakra had opened. This dream was so remarkable that still today I am intensely reminded of it. It showed me for the first time the reality of the subtle body in the Beyond. It seems that the supposed reincarnation of the deceased happens like this: They do not (or not only?) come back into the body of newborn children, as esoterics believes, but as a subtle body into the “subtle body part” of the body of adult people. This subtle body part seems to be located somewhere between the 1st and the 4th chakra. I just see that with the flat in the above dream I associated the flat of a woman whose name is Gertrud. Ger-trud is Germanic and means the one who carries the spear. Synchronistically to all this I posted exactly one part of my ms. The Holy Wedding, in which I describe and interpret the lance of Longinus = Holy Lance of the Grail legend; see http://unus-mundus.fr/viewtopic ... ginus#3620 . Using the (magic) lance of Longinus/Holy Lance means to aim (= lance) at the phenomena in our body, especially in the belly. It is what I call today Body-Centered Imagination. Thus, already more than 20 years ago the dream tried to show me that it is my challenge to develop such a method in which one "aims" in the state of the Wu Wei -- aim means here observe passively -- at the body, especially to the belly. I am at the place of my God-father Felix. I look at his images. One of them attracts my attention very intensely, and I feel a deep impression of it. It is the Teufelsbrücke (the devil's bridge) at the Gotthard pass (San Gottardo). When the San Gottardo opened at the end of the 13th century, the traffic increased incredibly. This is why the three cantons there, Uri, Schwyz and Unterwalden founded the basis of Switzerland. They did it to defend themselves against the kings of Habsburg who reigned over this part of Europe and charged the toll. In some victorous battles the Swiss beated the Habsburgs and were now able to charge the toll themselves. The San Gottardo is the HEART of Switzerland. I spent many nights on it, since I was so fascinated of the idea of a pass, especially this one. It leads from the north of Europe to the South. I interpret this as the pass from thinking to feeling, ie exactly what I postulate today as the necessary condition for doing BCI. The bridge is called Teufelsbrücke since it was a technological masterpiece, and thus the people there thought it was the devil, who had constructed it. 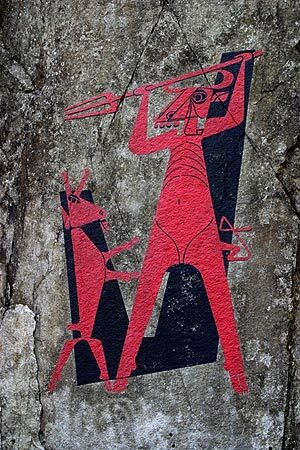 This devil is painted at the rock besides the bridge. Today I realize that the "devil" is a symbol of acausality, the "effect" without "cause," since one cannot describe it mathematically and like this cannot control it. The same is true for BCI: One cannot control what happens in it, since one lets oneself consciously fall into the state of the Wu Wei, the active passiveness, the Eros ego, in which one only observes what happens in the BCI. Such a behaviour is the big difference to A.I., since in the latter one is active and talks to the figures of the unconscious. Because of the passiveness and the state of not-talking and not-thinking in BCI one gives back the whole process to the world soul in the unus mundus, and only like this she can present us what I call the singular acausal quantum leaps. Suddenly I see that another motif is painted over the devil. It is the phenix who reincarnates out of his ash. In a paper that I wrote shortly before this dream I interpret the phenix as the subtle body created out of the physical body. This dream showed me for the first time that the subtle body and healing could be connected. This is why I don't believe in a subtle body theory (as most esoterics do), but I experienced it and still do so. Further it showed me that BCI has in some way to do with a resurrection. The resurrection I translate today with the observation of the creation of the subtle body. The latter is the individual aspect of healing. It seems however (since the subtle body is nonlocally connected with the world soul) that also the world soul (deeply hurt and raped by the invention of the nuclear bomb and the nuclear plants) and like this perhaps our beautiful mother earth could be healed. Last edited by Remo Roth on Mon Jan 15, 2007 1:58 pm, edited 2 times in total. Remember all the dreams of the UM members of the darkness as the one we have to deal with, not to convert it to the bright (Christianity; psychoanalysis), but to see that the "black sun," the black hole in the belly (which corresponds to the black hole in the middle of our milky way;svadhisthana?) is the real creation prînciple. I understood like this that what I call the singular acausal quantum leap, observable in our belly or also in the UFO phenomenon, is in fact the world soul, the feminine creation and incarnation principle. Since this principle is acausal, as is every singular quantum leap (as for example the natural radioactive decay of one single atom), one cannot control it with the help of the application of (causal or statistically causal) natural laws on it. Everything that is not controllable by the "bright sun" of the masculine consciousness (thinking/sensation) is however defined as evil. Evil is on the contrary the idea of the physicists to control such acausal events by defining a statistical causality for the mass of the radioactive atoms -- Wolfgang Pauli's black mass (as I wrote in http://unus-mundus.fr/viewtopic ... +mass#3051 ). Last edited by Remo Roth on Mon Jan 15, 2007 2:01 pm, edited 2 times in total. The two are usually a spiritual, free (not quite incarnated) soul and one more attached to the physical body. From the point of view of depth psychology, however, both kinds of soul are aspects of onepsychic totality, the Self. It seems therefore as if the Self, the divine center in man, possesses two aspects, one nonincarnated, purely spiritual, timeless-eternal; the other demiurgical, manifesting itself in physical matter. Two birds, beautiful of wing, friends and comrades, cling to a common tree, and one eats the sweet fruit, while the other regards him and eats not. Now here is the synchronicity: When I designed the rememberence cards for my father I found and used that very quote. Like this the physicists thought that they retrieved the power over matter (over the archetypal feminine principle). In fact, like this they were able to construct the atomic bomb -- with the name Trinity -- against Hitler. 3-2=1 as an example. This simple statement triggered a response in me and him when I explained it. I began with if 3-2=1 which 1 is left. This simple statement opened up a channel within me and at one point the idea came to me, "what if we were to apply it to the Trinity?" I forgot something else. You mention your Godfather's name being Felix, just last night my daughter-in-law came by and I asked if she had decided on names for the upcoming baby. She picked, "Felix," for a boy. Something very incredibly happens in the world -- at least in our tiny microcosm of the UNUS MUNDUS. You both should see my smile now! Yesterday afternoon my husband and I were just casually discussing and for whatever reason he used 3-2=1 as an example. This simple statement triggered a response in me and him when I explained it. I began with if 3-2=1 which 1 is left. This simple statement opened up a channel within me and at one point the idea came to me, "what if we were to apply it to the Trinity?" At times I feel as if I am spread out over the landscape and inside things, and am myself living in every tree, in the splashing of the waves, in the clouds and the animals that come and go, in the procession of the seasons" (MDR, p. 252). 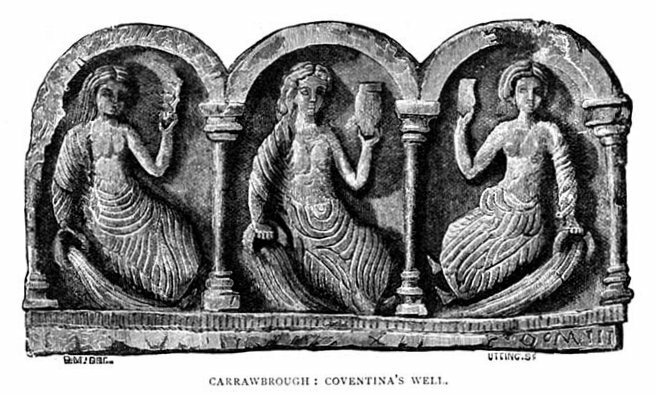 Carl Jung was however not yet able to integrate this experience into his theory, since he equated the anima (what I call the feminine spirit-psyche) with the anima mundi, the world soul, the tripartite goddess of the celts (I call this principle the matter-psyche, a necessary second part of the energy term, if one interprets the Axiom of Maria Prophetissa in a modern way). The tripartite goddes is the necessary counterpart of equal worth as the masculine tripartite god (the Trinity). Only like this, and not by adding a one-dimensional being (Jung's quaternity), one can describe the real background of our world, the unus mundus, and the processes happening in it. Marie-Louise von Franz told me once that Carl Jung was asked if there could come something else behind the Self. He answered that this is possible. However, it is meaningless to talk about it, since people do even not understand what he means with the Self. Above is the "vessel with breasts," and on the right of this vessel the remark (originally of MLvF): "Archetypus hinter dem Selbst = der Achte (Archetype behind the Self = the 8th). Then a description of the process follows (originally of MLvF). We see that between the four phases of alchemy, nigredo, albedo, citrinitas and rubedo, there are inserted four further steps: the mumification, the liquefying of the gold, the dichotomy and the treatment with the help of the vessel with breasts. Thus I knew at least symbolically that behind the Self of Carl Jung must come something further. I am in a villa, and around it there is a big and very beautiful park with big trees. It is the house where Carl Jung and Marie-Louise von Franz live together. There are also other people there, and we sit at a very long rectangular table. Carl Jung begins to speak and says: “I’d like now to speak about the one that comes behind the Self … “ He explains then what it is, but I forgot what it was. However, after this reunion I walk into a “Nebenraum” (adjoining room), a hall. Its entry is from outside (like the garages). Here at the walls there are wooden sculptures, which I palm. (Association of today: As a sculpturer I always palm sculptures. Only like this I can really feel their soul – the soul of matter, the matter-psyche.). I did not at all understand this dream then. I wrote under it: “I’m struggling with the anima integration, and the unconscious comes with such a dream … “I did not yet know that it was a dream about the anima mundi, and that the latter is something completely else than Carl Jung’s anima. This was the dream which led me to the Body-Centered Imagination and to the Eros Self behind Carl Jung’s (Logos) Self. The dream means that behind Carl Jung’s Logos Self there is a further realm, which has however to do with the vegetative (sympathetic/parasympathetic) nervous system (of which the the wooden sculptures are a symbol). Carl Jung's and Marie-Louise von Franz' house is a symbol of the corporeal (house = body) continuation of their work. The hall is the place where these wooden sculptures, ie the “inner aspect of matter and of the body," the subtle body/world soul aspect belong to. Thus the hall is a symbol of the unus mundus. The adjoining room (der Nebenraum) became a very important symbol in my dreams, especially in the years 1988, when I applied for the first time BCI with sick people. I began to understand that the adjacent room is a symbol of the "inner aspect" of space and of the body, which we can only observe with the help of the Eros ego. Like this I began to realize the Eros Self. I am more and more convinced today that the Eros Self or the unus mundus, the place of the world soul, is a "spaceless space" and a "timeless time" and thus equal to or containing the Beyond. This is why it is possible to have a relationship with the deceased in the Beyond, but only when we approach this "always/everywhere." I guess I already mentioned somewhere that I learned about this relationship the first time with a woman, who was diagnosed as schizophrenic. Yes, see http://unus-mundus.fr/viewtopic ... renic#3083 . The expressions "spaceless space" and "timeless time" are however related to our way to see space and time. Thus I postulate a qualitatively different space and time in the Beyond. The question is how it would look like. Here the subtle body/world soul concept enters the scene. This "always/everwhere" (= time is eternal and a point in space is the same as the whole universe) seems also to contain a different form of matter/energy. I call it the matter-psyche. I know visions of people which seem to show that with the production of artificial radioactivity we "fill" the unus mundus in a wrong way. This is why the "inhabitants" protest and tell us that we destroy the Beyond (and with this also the universe) or increase the "negative karma" there and in our world. However, if we do BCI it seems that we do the contrary: We decrease the negative karma, and the people in the Beyond are very thankful for this. It even seems that like this we help them to reincarnate. Clarice's vision confirms this view. As I wrote they seem to reincarnate in the corporeal visions of some people. Of course all this is yet speculation, but without some new axioms we will never understand all these strange phenomena like deeply corporeally sensated visions, UFOs/"ETs" and crop circles -- and healing. We can now ask ourselves what really is observable of the subtle body aspect of matter or of the body. If we postulate the twin process, we see that in this world we do not really observe the matter-psyche, but its transformation into spirit-psyche with increased negentropy. The latter can show in two different ways: As outer spirit-psyche with increased negentropy, ie as physical energy/matter of higher order (healing aspect on the corporeal side), and as inner spirit-psyche with increased negentropy (objective psyche = Logos Self with increased negentropy). The former would help the healing of the body, the latter the "healing" of the "spirit," or of the individual mind. As a qualitatively higher inner spirit-psyche it could show as a higher ethics of mankind. If so, the world would perhaps become a better place. Thus, what I defined as the observation of the creation of the subtle body would in fact be an observation of the increase of its quality, a higher negentropy. I can only interpret a “higher negentropy” of physical matter/energy as miracles that could happen – healing that would look miraculous for the materialistic physicians. In fact I know such healings in my patients. On the other hand one could imagine that by such processes the negentropy of the world soul or of the Beyond is increased. This could be the destruction of negative karma created by the most horrible political leaders of the world in the moment when they die. This process shows perhaps in the visions of a man I know: In them many of these horrible deceased come back to him and thank him for letting them enter into his altered consciousness when he does BCI. This would mean that it is in fact the subtle body aspect which is “filled” with their evil deeds. They had decreased the negentropy of the world soul, and this man has the duty to increase the negentropy of the world soul. I myself dreamed some years ago a dream, in which my hands were able to destroy the “totem of evil.” I still remember the noise which belonged to this destruction: It reminded me of an experience I had once in Vienna. In summer there are many insects, and since people like to sit in the outside, they invented a technology to destroy them. They are attracted by a bright light. Behind this light there are high charged electrical wires. They destroy the insects with a very typical noise. It was this noise I heard in this dream. Of course this dream could have meant that my hands (and the hands of other healers) can destroy the aspect of the “negative karma” in my patients, which led to the disease, and like this “positive karma” (increased negentropy of the subtle body) is created. But perhaps this is also true for the healing of the world and of the negative karma in the Beyond. Last edited by Remo Roth on Thu Jan 11, 2007 3:15 pm, edited 1 time in total. Last edited by Eduard Klarer on Wed Feb 23, 2011 10:14 am, edited 1 time in total. There are events which happen simultaneously in the inside and in the outside. I am at the bank of a river. There I see the ferryman. This ferryman is "inside/outside". I cannot explain this fact in a different way. Since the ferryman is "inside/outside," he can vanish into thin air and rematerialize. This ferryman is angry with the humans, since they are not able to believe and understand that this inside/outside really exists. Yet in this semi-somnolent state but already a little more awake, I immediately am more than certain that the UFO phenomenon is an manifestation of this state. Since we cannot realize this simultaneous inside/outside phenomenon consciously, it happens now unconsciously as the UFO and "ET" experience. I feel a real bliss because of all these deep insights. I had these associations more or less 13 ½ years after the original BCI of 1986. They show how vivid the original BCI still was in my memory. The new aspect here is that another property of the unus mundus is explained. It is on the one hand "inside/outside," does therefore not obey our idea of a physical as well as of a depth psychological space (outer and inner space), but tells us that this is the same. The subject/object border (? ; Subjekt-Objekt-Schranke in German) seems to be abolished. Further, entering this space means that matter (and energy) disappears, and comes back anew. Exactly how the UFOs and the "ETs" behave. Today I see that with this above phrase what I call today the twin process of Hermetic alchemy was described. In it one seems to enter a spaceless space (and a timeless time, ie eternity). By entering it, it seems that what happens in the observing or experiencing human, has happened everywhere. The twin process seems to constist in a first transformation of what I call spirit-psyche (outer spirit-psyche = physical energy; inner spirit-psyche = objective psychic energy) into matter-psyche, the yin aspect of the universe neither observable with physical nor with depth psychological tools. In this state the energy gets increased negentropy, ie higher order, and if a human observes this process the second process happens, the re-incarnation of this matter-psyche as spirit-psyche with increased negentropy. The latter seems, as I explained in a post above, to show on the one hand as some sort of an increased negentropy of physical energy, ie new physical laws of nature and perhaps completely new physical matter, on the other hand as some sort of an increased negentropy of objective psychic energy, ie new psychic laws of a new God-image. Have you seen this quatrain by Nostradamus? It seems to relate to the subtle body and perhaps even BCI. I came across this just this morning and it reminded me of the subtle body. No, Clarice, I don't know it. Belongs it to the prophecies? If yes, prophecy of which time? Yes it is part of the Prophesies, 4th Century quatrain number 25. The quatrains before and after are also quite interesting but more difficult to translate. Clarice - Remo's important point at the beginning that your dream is not a complex but a relationship with the actual Beyond and a visit by your actual father. Like William Blake and Dante it is what makes your dreams the thing of literature. If some day the European friends visit the highest regions of Canada where you live beneath Aurora Borealis, they must visit the town next to yours, Hearst, marked by the Phoenix - my family and I took the snow train through the forest there nine winters ago. In reading James Lovelock's recent book which claims only the highest realms near the artic circle will survive global warming, I thought of Hearst and you at the center of a new world. It would be lovely if we could all meet one day, and here in the north, how wonderful that would be. It would have to be when the Aurora Borealis are at their finest, Spring or Fall. And not only could we go to Hearst but we'd have to go to Moonbeam, home of the UFO. That would be very cool, indeed. Plus, I badly want to see the northern lights. I actually had the thought one time that I should go to the north pole so I would be surrounded by the magnetic drapes on all sides. But can they even be seen from that latitude? A "Convention of Misfits," I love it! Interesting that you would think about Rudolph the Red-Nosed Reindeer, a few years ago a friend told me that in one of the Rudolph movies there is a reindeer named Clarice. She said that the first time she met me she immediately thought about Rudolph. The North Pole is a very vivid image here. I had big dreams about all of this. It would be a wonderful location to all meet. I can't believe it -- that's true, that must be why the mistfit idea came up! In the animated movie about the story of Rudolph the character 'Clarice' is a little doe who is Rudolphs' childhood sweetheart (later to be his mate)! She never gives up on him, despite the fact that he is 'different' and all his other peers (initially) reject him...sounds about right,eh (the UM 'misfit' phenomenon!)?? What's really strange is that the name "Clarice' came up the other day in our family, and my sister reminded us that she was the little doe in the "Rudolph" kids' Christmas story from t.v. I immediately thought of you! "We're a couple of misfits, why don't we fit in?" Sometime after singing this song they go off on an adventure, a sort of adolescent coming of age journey through another world, a trackless land of bleak ice and snow, where they meet the Abomidable Snowman. Later they also rescue the misfit toys and Santa Claus delivers them across the world on Christmas Eve -- the love that all the misfits (both toys and creators) have to offer is thus finally fulfilled, now 'gifted' to the children of the world (that's the idea anyway)(I gues we can find a metaphor for the 'anti-bomb generators', the 'UM misfits', in this story pretty easily!). Thanks Clarice for suggesting a magic possibility! 13 years ago when I was still in North Carolina - Feb. '97 - I remember because Hale-Bopp comet hung over our farm for a month & I dreamed a yellow monk in it - I dreamed of walking briskly through an ice mountain to the North Star, due north. A few years later my wife got a situation in Ann Arbor, Michigan and for vacation, we took the snow train to Hearst. It was like a magical ride because the conductor dressed as train conductors of old. About 20 hours from Sault Ste. Marie on the Canadian border through snow covered forest and frozen waterfalls - Canadian wilderness, no towns or roads. When we arrived at Hearst it was like arriving at the center of the dream I'd had. As when Black Elk said, "This is the center of the world;" a little French-speaking enclave way high in English-speaking Ontario. I'd been writing these essays about how certain live spots along the Mississippi form chakras in a division line between the Eastern World and the Western World with the Lakes, the Manitou - Earth Spirit of Native Americans - a sacred water-center in the Center. In the Hearst/Kap region I felt I was at the high chakra; the one which floats above the head. A few years later when I discovered Clarice and her organic dreams of the Sun King, etc., I was not surprised that she lived in the next town from Hearst. I noticed when the strange and mysterious J.J. Abrams production "Lost" about plane crash survivors lost on a Taoist island with pyschic qualities (in which the earth is presented as strange and psychic, much as space was in the early UFO movies in the '50s) - the season ended with quotes from the Bible Mr. Eko's had carved on his Jesus Stick which read " . . . go to the North" but I couldn't quite get the reference. I had the following dream a few nights ago and sent it to Roger. His reply follows and then what happened from there. I was walking with my mother down my grandparents' Avenue. As we passed my grandparents’ house I noticed that there was a new house now built on the land. It was either 6 or 8-sided and had a straw roof. My mom said that it looked cute and I agreed but I didn’t like it because it looked like the Hansel and Gretel house. We talked about the straw roof and I wondered out loud whether it was real. Then I remembered and told her how a few days earlier my husband and I had cut across my grandparents’ land and we had seen the construction products on the lawn and we had seen the bales of hay – so it was real hay. We kept on walking, we were going to A&W, and it was a nice spring day. The snow had all melted and there had been a fresh rain because the ground was wet. The air was fresh smelling. It was 4:30pm. The main feeling in the dream was that I was worried that someone had taken over my grandparents' land. And the thing about Hansel and Gretel, well I remember that about a week ago I made reference to Hansel and Gretel, particularly the witch's house but I can't remember what it was all about. For the longest time, in my dreams, I've thought of my grandparents' house as my portal to the "other side," so I am wondering why first of all the house is gone and second a new house is in place? The house was made of red brick and I have a vague memory from the dream of actually touching the house and it was both a real house and a miniature at the same time (very difficult to explain.) A&W was a restaurant that my mom and I used to go to a lot when I was young - there is still a restaurant there but it isn't an A&W. I have had A&W dreams in the past - but you know just as I am typing this I realized a newer association - when we went to my father's funeral we spent most of our time eating at A&W's; they are really popular in the West. Just a hunch : what if the new house were you ? In the back of my mind, as I was first sending him the dream, I thought of that possibility but I didn’t dwell on it. So when I got the reply I immediately contemplated the possibility. Wow, what possibilities exploded! I still don’t remember what I was referring to lately as I compared something to the witch’s house in Hansel and Gretel, but I suddenly remembered – or spontaneously associated (because this was not a repressed memory) that I had played Gretel as a child in our town’s annual parade. As I sat and I mused about the possibilities that I was the house from Hansel and Gretel I wondered about what happened next in the story after "the end." I thought about today’s society and the state of the world and how Gretel would have coped with that and perhaps retreated to her house in the woods. I also loved the Hansel and Gretel book, the version by Little Golden Books, illustrated by Eloise Wilkin. This illustration is not part of the story but it is the picture on the inside cover of the book. It is not the witch’s house after all that had a straw roof but the family home. The witch’s house was made all of candy and gingerbread. I see too that this house is not made of red bricks but the roof is clearly made of straw. So part of this is correct. The red brick house reminds me of when I was a child and my wish when I grew up to live in a red brick house. As I was musing about the house, I was babysitting, and I realized that the cartoon we were watching was taking place in a farm setting and all the houses had roofs made of straw. The Sadness. Before you were born there were two occasions of sending messages to whoever was thinking of coming to be born. Freedom (you’d be welcome regardless of personality) and knowledge (you’d have access to everything.) Didn’t send the sadness but it had been present. So tonight when we drove right past the house where he used to live when he met my mom I felt like I was receiving the signal, the message, once again from my dad, but this time he was on the other side.